Is your fuel gauge inaccurate? Is it no longer working at all? This is a common problem on older boats, but is easy to fix. The first step is to determine whether the problem is with the gauge or the sending unit. The test for this is straightforward. First, check that the gauge is receiving 12 volts of power. Turn on the engine’s ignition and probe with a multimeter between the ground and the positive terminal on the back of the gauge; it should be marked with a “+” or an “I.” If there is no voltage then the fault is in the ignition circuit—and the gauge is probably good. If there are 12 volts at the gauge, either the sender, the gauge or its wiring is the culprit, so you need to proceed to the next step. With power running to the gauge, disconnect the sending wire; it will be marked with an “S” at the back of the gauge. Once the wire is disconnected, the gauge should jump to its highest possible reading. If this is the case then the gauge is good and you can proceed to the next step. If the gauge does not reach its maximum reading, it is faulty and must be replaced. Another test is to jump a wire or a screwdriver across the sending pin to the ground pin on the back of the gauge. If there is no ground pin, use a longer wire and jump the sending pin to the engine block. When you do this, the gauge should go to its lowest reading. If it does, it is working properly. If the gauge is good, the next step is to check the other system components, as either the wire running to the sender or the sender itself must be faulty. To check the wire, disconnect it from both the sender and the “S” pin on back of the gauge. Set your multimeter to the Ohms scale and check the resistance within the wire. If there is no resistance (as close to zero Ohms as possible), the circuit is good and the sender is faulty. In most cases, the sender and the fuel gauge need to be matched to the resistance in the sender’s rheostat, so to be completely sure you are getting accurate readings, replace both the sender and the gauge. Several companies provide pre-packaged “ready-to-go” installation kits. Most sensors have a mechanical floating arm and a rheostat. When the arm is all the way down, in the “empty” position, the resistance in the circuit to the gauge is near zero. As the arm rises, resistance in the circuit also rises to around 200 Ohms. This resistance is what moves the needle on the gauge. Often a problem occurs when the sending unit’s floating arm becomes inoperative. On older units the floats may be made of cork. Over time these floats can lose buoyancy or even sink altogether, causing the fuel gauge to indicate that the tank is constantly empty. Another common problem results when the rheostat doesn’t transmit the correct electrical current to the fuel gauge, even though the floating arm is moving up and down properly. In this case, both the sender and the gauge need to be replaced. Left: My new sending unit installed. The sending wire leads off the center post; the other wire runs to ground. Note the marks I made to align screw holes (dark) and the float arm inside the tank (in pencil).Right: The new fuel gauge. The wire marked “+” runs to the engine’s ignition switch. The center wire is ground; the one on the right is the sending wire. Having obtained a new fuel sender kit, you should follow the directions specific to your new unit. In general, installation will involve the following steps. Note that senders are not usually “plug and play” units. The length of the sender arm may have to be modified to fit the dimensions of your fuel tank. This also ensures that the gauge reads properly. First measure tank depth from the top of the tank, near the sending unit, to the bottom. This measurement determines the length of the sending unit’s float arm. Next, trim the kit’s sending unit arm—they usually come in 24in lengths—and match it to the tank depth. A strong pair of wire cutters will work with most units, but some require a hacksaw. Once you have cut the float arm to the correct length, fasten it with setscrews to the flange of the new sending unit that will be screwed into the top of the tank. The sending wire will come off a post in the center of the flange. There may also be a ground wire coming off a second post at the edge of the flange. Both wires lead to the back of the fuel gauge. Turn off the power running to the boat’s systems before you disconnect any wires. Then disconnect both the sending wire and ground wire on the old sending unit. Note that if the gauge is grounded directly to a tab on the tank, there may be no ground wire. Remove the screws that hold the sending unit to the tank and take it out. Next, remove the three wires on the back of the old gauge. One wire goes to the center pin on the tank sending unit, one goes to ground, and the third connects to a 12-volt source, normally the ignition switch. Remove the fuel gauge. Install the new sender by lowering the float and float arm into the tank. Be sure to slide a new gasket into place under the flange, then align the gasket with the holes in the sender and in the tank. When the gasket is aligned, mark it in relation to the flange, as it may turn while you are centering the screw holes to match the tank holes. Mark the screw holes in the tank for easier alignment; the flange will cover them and make them difficult to locate. Check to be sure the float arm can move freely and will not stick in a corner of the tank or against a vertical wall. Orient the sender unit so the float arm’s movement is not hindered. You can check this ahead of time by holding the sender next to the tank before you install it to see which way the float can move freely. Once you know the proper orientation, duplicate it when you put the unit in the tank. To minimize confusion, use a marker to show the direction of travel of the float arm once the screw holes are aligned. Put in the new screws and tighten them down. 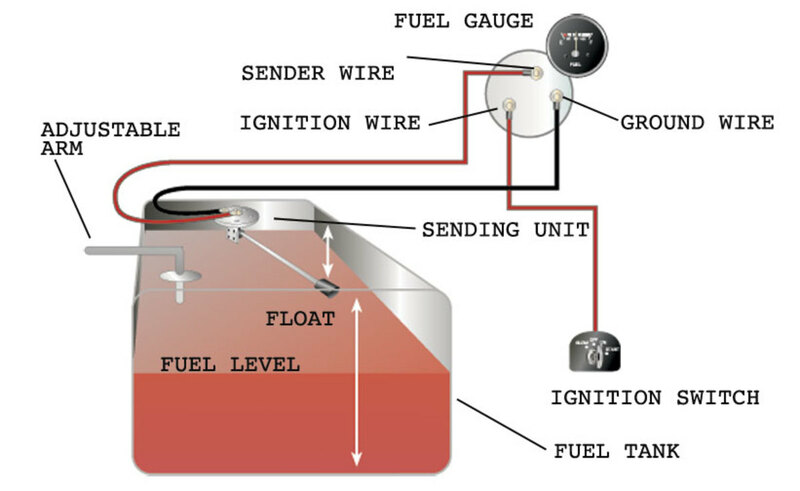 Check the wiring diagram that comes with the kit and mark the back of the new fuel gauge with symbols for each post: “S” for the sender, “G” or “—” for the ground, and “I” for the ignition. Install the new gauge, reconnect the wiring and turn on the power. The fuel gauge should now show the correct fuel level in the tank. To make sure the readings are accurate top off the tank. Problems often involve incorrect grounding and inadequate power. If the gauge does not read at all, check the power with a multimeter at the gauge terminal. Test between the positive terminal on the fuel gauge and a good ground; the reading should be 12 volts. If it isn’t, check the ignition circuit. If that reads 12 volts, turn off the ignition. Then use the Ohm scale on your multimeter to check continuity between the ground terminal on the gauge and ground; the reading should be at or near zero Ohms. If not, recheck the ground circuit. When everything is working properly, your new fuel gauge will give you a proper reading. Now you can relax, even if there is no wind, as you will now know whether you have enough fuel for your iron genny to carry you home safely.